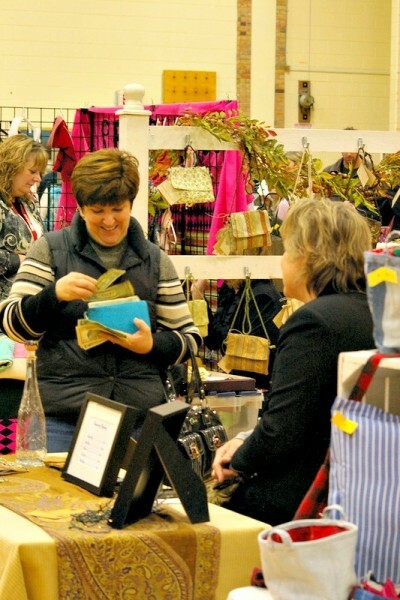 The art market will be held Saturday, November 7 from 9 a.m. to 4 p.m. and showcase artists and crafters from all over Michigan. Grand Rapids City High Middle School is hosting its 7th Annual Recycled Art Market this coming Saturday, November 7. The art market will run from 9 a.m. to 4 p.m. Up from the 17 artists hosted in the first year, this year’s event will host 70-75 artists. Sixty of the artists use materials that are recycled, upcycled or repurposed. The remaining 10-15 artists are all creating items that are handmade or use natural materials. Teri O’Driscoll of Right Brain Events is managing the market. She is also its founder. When her daughter was going to City as a seventh grader, O’Driscoll brought the idea to the Parent Teacher Student Association (PTSA) and principal, knowing they were looking for fundraising ideas and her artist friends were looking for more shows. Artists come not just from the Grand Rapids are, but also from Manistee, Holland, Detroit, Kalamazoo, and Battle Creek. Victory Wood Shop repurposes old wood into signs, clocks, tables and chairs. O’Driscoll says they’ve been known to sell out by the end of the day. Scrappy Lynn and Simply Sewn by Susan will have mittens, scarves, slippers and other cold weather gear made from repurposed sweaters. Canned Sunshine upcycles canning jars made into solar lights and her silver spoon bracelets. Treasured Blessings Recycled Art Creations makes risen platters, hummingbird feeders and bird baths. Chella's Collection makes jewelry with repurposed maps. 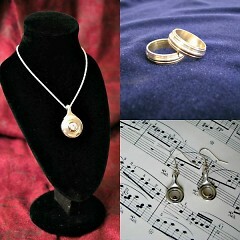 Fret Knot Jewelry shapes and solders recycled guitar strings to create jewelry, wall art and decorative frames. WojoWorks will have original paintings as well as mixed media collages. Noteworthy Elegance takes unwanted flutes that are beyond repair and creates beautiful pieces of jewelry from the sterling silver flute keys. “I know and really commend this group of artists because the majority of them bring something new to the table every year, which is very admirable because it’s not like they continue to show the same things over and over again,” says O'Driscoll. O’Driscoll notes that there are a lot of great stories behind the pieces and the effort the artists put into sourcing their materials. City High Middle raises funds through the event from booth fees and the $2 admission. 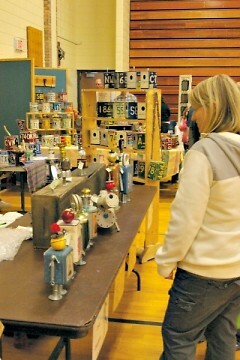 The Recycled Art Market will be at 1720 Plainfield Ave NE, 49505, with a $2 admission. Coffee and beverages, as well as breakfast and lunch items will be available for purchase.